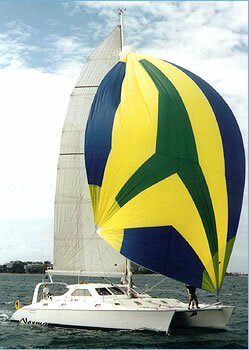 This Catamaran was designed for a French business couple from Noumea to live aboard standard. It is their third catamaran ownership. Comforts include dual refrigeration, dual hot water system, gas stove and oven, microwave oven, dish and clothes washers, 6.5kva generator, desalinator, dive compressor, 5 sets of scuba gear. Having logged 25,500 nautical miles in seven years, the craft has proven to be comfortably handled by two persons.